Ahhh! It’s a flower monster! Run away! Your excellent description of monster flowers was spot on, so of course, I ran away with it! I love the blood tipped teeth you captured, too. Photo is stunning! Then your bee film inspired this piece, as well. Ha! You practically wrote this haiku!! The horrific side of flowers is rarely explored — people tend to focus on their superficial beauty — and ignore the true monster within. Bees secretly induce spontaneous creative paroxysms…shhhh…don’t tell anyone! Paroxysms? What are you doing?! I thought you were a caveman! I’m sorry! I was thinking about the dynamics of red dwarf stars and it reminded me of the muse-like nature of the eastern bumblebee. Always making fun of me! Lol. I did dream about you the other day (I was at a cafeteria with a tray of food and you knocked it out of my hands). That’s all I remember. Wonder what it means? It means that I saved you from food poisoning — never trust cafeteria cuisine — even in a dream. Ha! Oh, I did remember you apologizing afterwards — then I woke up screaming. 😀 Just kidding. I’m polite…even in a dream! See? Nothing to worry about. Most people wake up screaming. I go to bed screaming. And that makes all the difference. Kinda scared to ask, but here goes — why do you go to bed screaming? Scared is a synonym for thrilled. You’re a great therapist! Asking such a traumatic question, and then leaving the room — it forces your patient into a deep introspection — which grants them the ability to conceptualize and solve their problems. Tis the season for fun and you don’t disappoint! Wonderful contrast exemplifying how difficult it can be to differentiate between beauty and ugliness, and the pain or pleasure each can potentially offer. Side note: I never authorized Jonathan to mention my name in any posts. I have changed his password locking him out of wordpress. Now you will see the real romance a male canine can bring to the writing table. Mi amor! 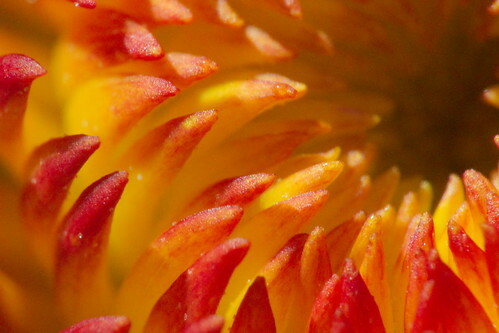 When you see it close up like this, that really is one scary flower. It reminds me a bit of Audrey in Little Shop of Horrors. I wonder if it can sing? It is pretty funny. It also did nothing to change my feelings about dentists, as I remember. I loved your teeth post! Soooo gooood!! The day of the Triffids all over again. 😀 — I love it when you scream like a girl!